Marvel has a bajillion superheroes, so I’m not going to tackle all of them. Even single heroes exist in multiple universes (I’m serious) so I’ll keep to the most canonical arcs. Based on my discussion with friends about my previous post on ghosts in Pixar’s works, it’s worth restating that a tragic backstory event does not automatically function as a ghost. My example in Pixar’s canon was Remy’s loss of his colony. Similarly, Superman’s whole planet got blown up, but that isn’t really the reason he saves earth. He saves earth because it’s the right thing to do. The thing he’s running from is himself, the idea that people will discover his true identity. Almost all Marvel characters have something tragic in their backstory, and I’m not enough of a fanboy to precisely lay down all the ones that qualify as ghosts and which don’t. For example, I can’t tell if Ironman’s looming death is the reason he fights, or if that’s just something he decides to do because he can. I’m not sure if Wolverine fights Magneto because he feels traumatized by Weapon X and his lack of past, or because he wants to protect other mutants, more like Superman. It is completely possible to have a good character and a great story without using a ghost to drive them. But let’s see how it helped to develop two of Marvel’s most enduring heroes. Captain America’s ghost is his past as a weak, scrawny kid who got picked on and wasn’t allowed to join the military. He also witnessed the abuse of his mother, which he was unable to stop. He turns into super beefy awesome soldier and… well, what could he possibly have to learn? What is the inner trauma that he has to heal? You’d think that he would have to accept himself as super beefy awesome guy, and the movie experimented with that, but it’s not the arc that works best for him. 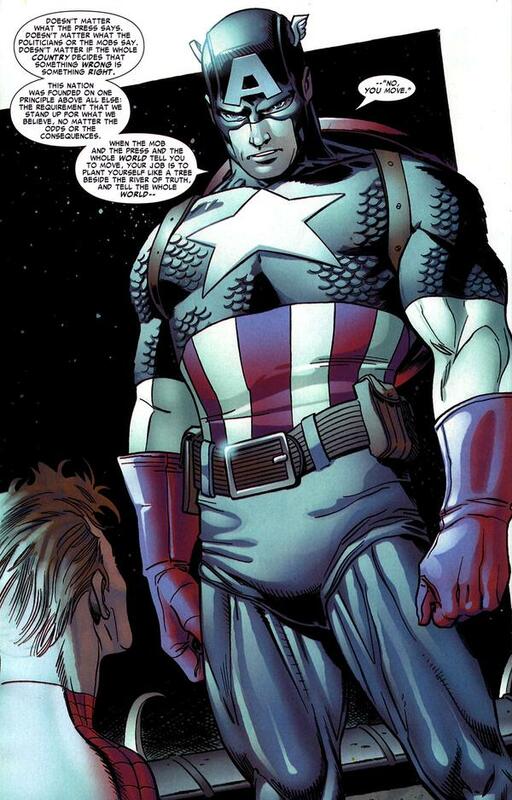 When Captain America is at his best, he is moral authority. Rather than having to overcome his past as a skinny kid, the knowledge of what it’s like to be abused gives him sympathy for others and wisdom. While, yes, like many, I find the idea of a character named Captain America acting as moral authority somewhat problematic, most instances I’ve seen handle him well. For the record, it’s not enough for me that the character is separated from the government. He’s still tied to an idea that “America” is a thing, and a good thing, and that’s the part I take issue with: American Exceptionalism. Spider-Man’s ghost is interesting because it happens AFTER his inciting incident. The story starts when he gets bitten by the radioactive spider. And then we have a few story beats of Spider-Man just being awesome. Learning to swing from buildings, fooling around with professional wrestling, throwing the school bully in a locker. Whoo! I’m into the Spider-Man character, even if I don’t find a lot of the stories involving him very satisfying. His ghost doesn’t force him to make difficult choices very often (blonde or redhead?) but it does layer the pressure on his shoulders. Which works especially well for Peter Parker as a teenager. Homework. Bullies. Money. Identity. Supervillains. And then a beautiful saucy redhead comes out of nowhere and loves him. HOW DOES THAT FIT THE THEME? Ugh. Peter Parker, Mary-Jane Watson, and Gwen Stacey do NOT work as a love triangle. Or maybe I just hate a certain kind of love triangle. This could be a whole ‘nother post. Come back in two weeks when I rant about love triangles. Spoilers! For almost all of Pixar’s movies! Traditional thought is that the first step in a story is the inciting incident: a break in the every day, something that starts the journey, the call to action. However, many good stories have an important step before that: the ghost. The ghost inflicts the wound. Most often, dead parents inflict the sense of not belonging. Ghost: a specific event in a character’s backstory that has left emotional, psychological, or moral damage. It haunts the character and drives them through the main story. Wound: A character’s deficiencies that are causing pain to themselves and the people around them. Healed or deepened at the end of the story. My previous post on Pixar’s simplexity was my most popular so far. Today we’ll look at the way they use ghosts to drive their films. In the top example (Finding Nemo), we see Marlin left with Nemo after a shark attack has killed his mate and their hundreds of other eggs (ghost). This leaves him feeling scared and overprotective (wound). The second picture (The Incredibles) shows how Mr. Incredible was forced out of the superheo line of work, by getting sued (ghost). He winds up in an office feeling alienated and needing validation (wound). Picture three (Up) has Carl’s last moments with his wife Ellie. Her death (ghost) leaves him bitter, isolated, and rough (wound). Woody’s rip in Toy Story 2, Wall-E’s isolation, and Mike’s first trip to the scaring floor in Monster’s University. but I like the first three I showed because I find them the most powerful and original. The cliché is for dead parents. Finding Nemo is a reversal: dead children. The Incredibles makes a ghost out of something organic to the film’s world, and in Up the power of Ellie’s passing is noted by everyone who sees the movie. So how does a ghost work? In the fiction workshops for my creative writing degree, two of the most ubiquitous comments were (1) Why does this character need to go through this story? (2) Your character is too perfect. Having a ghost addresses these concerns, as well as others. Basically, the ghost is what has wounded the character, and the story is the healing process. Chronologically, it usually happens first, but we don’t always see it in the story, because the “story” usually starts when the healing process starts. That is, when they start the journey that is going to address their deficiencies, and probably cause their character to change. Ghosts are either flashback or prologue. Since Finding Nemo, most of Pixar’s films have included a prologue to establish the character’s ghost and wound. But not every prologue is a ghost. Remy in Ratatouille wanted to be a chef before he lost his clan. The event is tragic, but it doesn’t really do much to haunt or influence him for the rest of the story. He has a literal ghost following him around, but Gusteau functions as a mentor. Similarly, Merida in Brave has a prologue in which we meet Mar’du, but this isn’t the thing that drives her arc. Unless somehow this was the moment that caused the split between her and her mother, but it wasn’t. You could be like, “Yeah it was, because she got her bow,” but then you’re just being difficult. Neither Remy or Merida seem to be psychologically running away from inner trauma. They are running toward their aspirations. Which is still interesting, but it needs the audience to share sympathy for the kinds of aspirations they have. As someone who’s really not that into eating food, I had trouble getting into Ratatouille, whereas my friend who’s worked in kitchens loves it. I share the longing for fantasy freedom though, so I like Brave more than most. I believe this is why Cars doesn’t resonate as well with a lot of people who like Pixar’s other films. Lightning McQueen’s drive (no pun intended) is based on a dream of racing, and his redemption is based on the nostalgia of scenic Route 66. Neither of those things ignite much in me. Ghost inflicted wounds tend to be more universal, so in my opinion they often lead to better films. The first time I encountered the terms was in John Truby’s The Anatomy of Story. In case I haven’t been explaining clear enough, I’ll include his introduction to the concept. There are two kinds of ghosts in a story. The first and most common is an event from the past that still haunts the hero in the present. The ghost is an open wound that is often the source of the hero’s psychological and moral weakness. The ghost is also a device that lets you extend the hero’s organic development backward, before the start of your story. So the ghost is a major part of the story’s foundation. You can also think of this first kind of ghost as the hero’s internal opponent. It is the great fear that is holding him back from action. Structurally, the ghost acts as a counterdesire. The hero’s desire drives him forward; his ghost holds him back. Henrik Ibsen, whose plays put great emphasis on the ghost, described this structure step as “sailing with a corpse in the cargo”. So those are my thoughts on Pixar. You know who else creates interesting ghosts? Marvel. Come back in two weeks. I’ll examine ghosts for some of Marvel’s superheroes.